We never sell copies or reproductions of any kind; this photo has been hand-signed by Gordon Ramsay, Anthony Bourdain & Mario Batali. Anthony signed this photo at CBS This Morning in New York City on April 10, 2012. Mario autographed this picture at Good Morning America in New York City on April 19, 2012. 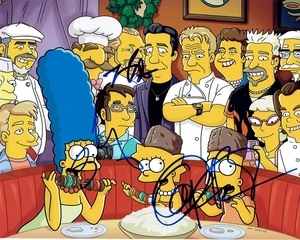 Gordon signed this photo at the Fox Upfront party in New York City on May 14, 2012.